Brussels sprouts regardless, all my friends hated the vegetable. After getting married I tried a recipe for roasted Brussels sprouts and my husband and I fell in love with the cooking method. Now I make roasted Brussels sprouts a lot in the spring and my whole family loves them. Tonight I made roasted Brussels sprouts and mushrooms, here is the recipe. Toss all ingredients together in a bowl. I added 3 diced young ramps for flavor, shallots would also work (however, this isn't a necessary step). Place on a baking sheet and roast in a pre-heated 400 degree oven for 20-30 minutes. Toss the vegetables every 10 minutes to prevent burning. If you want a bit of extra flavor you can add cooked crumbled bacon over the vegetables before serving. That's it. Roasting vegetables is a great way to get kids to eat vegetables and my whole family loves it. It also works well with asparagus or green beans. 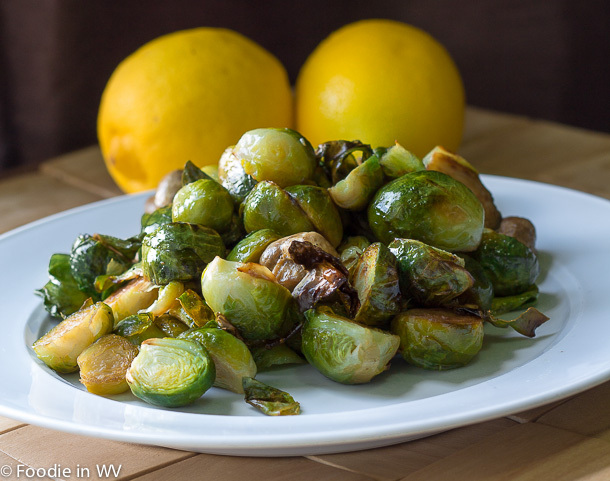 Not a big brussel sprouts fan but roasting them might make it more attractive to my palate! We love roaring our veggies too! Sounds delicious! You're right about roasting veggies - my kids prefer them that way, too. They really are more kid friendly when roasted. I've only had this veggie frozen as a child, and I wasn't a fan. I bet I'd like it quite a bit now, and roasting really appeals to me. Frozen Brussels sprouts are the worst, they get so mushy, yuck! Oh my, those look delicious. We love both brussels sprouts and mushrooms. Thanks :) We do too! Those look good.......Thank you for sharing with the Clever Chicks Blog Hop this week; I hope you’ll join us again! Roasting them really does make them taste better. They are also delicious shredded and cooked with white wine.